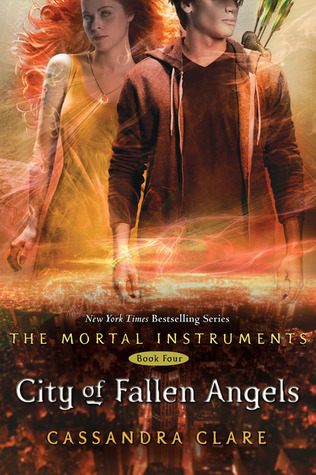 My thoughts on City of Fallen Angels (The Mortal Instruments #4) by Cassandra Clare. Simon, for instance, is “seeing” both Maia and Isabelle. The Daylighter who wants so much to return to being a human has a very human problem. Deciding between the two of them, or in Simon’s case just making sure they aren’t invited to the same events. Simon also had a first in his book. He drank from a living, breathing person. Granted, he didn’t do it well and Kyle had to save the day, but he had his first taste of fresh blood and experienced the high that came with it. He is definitely a lot more “grown up” than he was in the earlier books. Alec. (I’m tackling the easier characters first!) I was very disappointed at the start that he and Magnus were touring Europe. I shouldn’t have worried that they would lacking in this read; he and his man were largely involved in the second half of the book. And oh were they funny at times. Magnus has been there and done that (girl, guy,…), and it has poor Alec so jealous. The resolution is so endearing. Just about brought me to tears. Go Magnus – way to say the right thing at the right time! Yay! Jocelyn and Luke are preparing for a wedding. I really like Luke. I’m happy that things are at long last working out for him. Being a former shadowhunter turned werewolf has given him lots of perspective. I hope Simon continues to lean on Like when he needs help. I’m also assuming the wedding will happen in the next book, maybe? Jace and Clary. What a mess. Maybe I should say roller coaster. One minute Isabelle is telling them to get a room and the next Jace is avoiding Clary because of his dreams. Well, horrible nightmares are a better way to describe them. Everyone around them can see the love they have for each other, but do they recognize it? I was so happy when Jace finally confessed to Clary what had been troubling him. Secrets don’t always stay secret…at least not in the world of shadowhunters. City of Lost Souls is book #5 in the series. Looks like I need to stop by the bookstore in the next day or so.